Monster is a multi-award-winning, provocative coming-of-age story about Steve Harmon, a teenager awaiting trial for a murder and robbery. As Steve acclimates to juvenile detention and goes to trial, he envisions the ordeal as a movie. 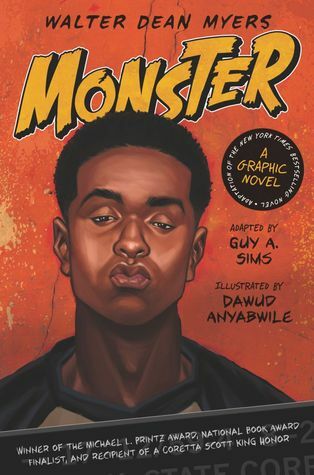 Monster was the first-ever Michael L. Printz Award recipient, an ALA Best Book, a Coretta Scott King Honor selection, and a National Book Award finalist. Now Monster has been adapted into a graphic novel by Guy Sims, with stunning black-and-white art from Dawud Anyabwile, Guy’s brother. Fans of Monster and of the work of Walter Dean Myers—and even kids who think they don’t like to read—will devour this graphic adaptation.